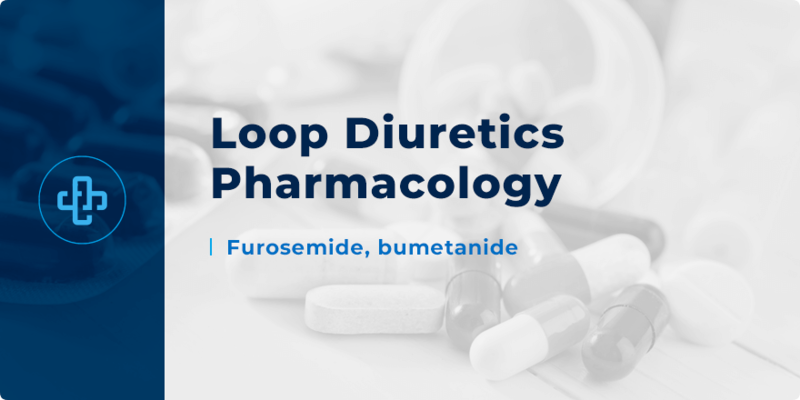 Loop Diuretics Pharmacology | All the Facts in One Place! Diuretics are drugs that promote diuresis; a process that leads to increased production of urine. The purpose of every diuretic is to promote water loss. Of course, there are many types of diuretic – including thiazide diuretics. Here though, we focus on loop diuretics. Loop diuretics achieve their diuretic effect by acting on the ascending limb of the loop of Henle; a part of the nephron named after the acclaimed German physician and anatomist, Friedrich Gustav Jakob Henle (1809-1885). Over the course of this guide, we review their mechanism of action, side effects and drug interactions. We also take some time to review important clinical considerations. First, let’s take a few minutes to learn more about the primary indications of loop diuretics. Chronic heart failure – treating symptoms of edema accumulation. Hypertension – fluid build-up leads to higher blood pressures. However, loop diuretics are not first-line treatment options for this indication. Pulmonary edema – loop diuretics are used to relieve breathlessness. They are often used alongside other treatment options, such as oxygen and nitrates. Liver / renal dysfunction – treating fluid build-up associated with these states. Edema is the common thread that weaves its way through each indication. Edema refers to the accumulation of fluid in certain parts of the body. The more fluid build-up, the more “swelling” manifests. Indeed, the word “edema” takes its name from the Greek to mean “swelling”. With these indications in mind, let’s learn more about the mechanism of loop diuretics; how they manage to promote diuresis and eliminate edematous states. Knowing these processes is essential to properly understand how any diuretic works. Loop diuretics act on the thick ascending limb of the loop of Henle. Along this limb, these drugs inhibit a protein responsible for sodium, potassium and chloride transport – a protein called the Na+/K+/2Cl– transporter. More specifically, loop diuretics compete with the Cl– site of the transporter – reducing reabsorption of the above ions – with water following by osmosis. It’s precisely this water loss that contributes to the therapeutic value of loop diuretics. However, loop diuretics also work by a secondary mechanism – namely, dilatation of capacitance veins; an effect which reduces preload and enhances the contractile ability of cardiac muscle. Both effects – water elimination and vasodilation – combine to generate the therapeutic potential of loop diuretics. The above mechanism of loop diuretics directly contributes to its side effect profile. Loop diuretics are associated with their own range of potential side effects. More seriously, loop diuretics are also linked to ototoxicity. Because the endolymph of the inner ear is also regulated by a similar transporter, loop diuretics may impact electrolyte balance in the ear and lead to tinnitus, vertigo and deafness. That loop diuretics are contraindicated in patients with dehydration or severe hypovolemia. That loop diuretics may impact other drugs eliminated via the kidney. For example, lithium levels may rise due to reduced excretion. That loop diuretics can increase the risk of ototoxicity and nephrotoxicity in patients taking aminoglycosides. That loop diuretics should be used with caution in patients with hepatic encephalopathy – a condition in which hypokalemia can worsen coma. Similarly, caution is warranted in patients with pre-existing hypokalemia and hyponatremia etc. Taken over the long-term, loop diuretics can reduce excretion of uric acid and, by extension, worsen gout. That loop diuretics increase the risk of arrhythmias – due to hypokalemia; a risk potentiated if they’re taken with antipsychotics such as amisulpride. Patients should be counselled that because their bodies contain excess fluid, they need to take loop diuretics and pass urine more often. Taking the drug early in the day prevents onset of nocturia. Loop diuretics are classified as pregnancy category C – meaning that “risk is not ruled out”. Due to the risk of hypokalemia, drugs such as furosemide are available in combination products with the potassium-sparing drug, amiloride (Co-amilofruse). Loop diuretics continue to play an important clinical role in the treatment of edematous states. Knowing how they work, what side effects and drug interactions they have, and how these facts implicate therapeutic matters, is an absolute must for every student. Want to learn more loop diuretics pharmacology? Register with PharmaFactz today to receive instant access to tutorials, quizzes and infographics – everything you need to master the subject. In the meantime, take a few seconds to join our newsletter (above) to receive all the latest information direct to your email!